IP stands for Internet Protocol, which basically means an online web address. So, how does it associate with video surveillance? Most digital video surveillance technology is connected to a network. Even older systems that utilize an analog camera can convert the signals into digital images with the use of video encoders or DVRs. However a real IP surveillance system utilizes IP based cameras. These have the properties of the pictures and video being accessible without the need of video equipment to convert the signal. Using IP technology is beneficial compared to analog CCTV cameras. The IP camera has a built in computer, so it can run standalone. Lots of features, like motion detection, remote access and I/O inputs can be utilized without the need for extra hardware. Once coupled with an IP recording program (such as Visec), lots of other features are added to provide state of the art recording and monitoring. A concern with video surveillance is the limitation of accessing the surveillance system. With analog and CCTV cameras, one needs to physically be in the area where the cameras are installed. This limits your capability to see the security feed. IP cameras allow more flexibility, such that one can access the cameras from any area, at any time desired. A person can see either live video in real time, or historical video stored on the hard drive (or even directly from the camera’s SD card). Then using software tools one can copy the video remotely over the network to a local computer for evidence and incident management. Accessibility to see live or recorded video can be done using almost any computer, or web based device, such as smart phones and tablets. Another issue regarding surveillance systems is the issue of components. With most security cameras, you purchase cameras, wires, and a recording unit. 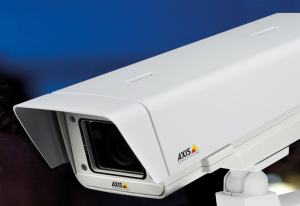 With IP cameras, you purchase similar components but more uniform and precise equipment. For example, an IP based camera can plug directly into a business or home network router. A small office wanting 4 cameras could connect the IP plugs (rj45 connectors) directly to their business internet switches, and even in many cases use the same computer they have for surveillance. IP cameras are the most efficient means of protecting a site. With analog CCTV cameras, there are cables, cameras and central units that one needs to buy or rent. As newer systems became accessible, the old systems usually need to be upgraded entirely and the old equipment thrown out. An IP system needs cameras, software and usually nothing more. Last but not the least is the issue of flexibility. Analog CCTV cameras need wires run to a control unit. IP cameras have the capability to connect to a network switch, meaning you can broadcast video over a wireless network or even a satellite. What’s more amazing is the computer server could even be stored onsite, or offsite in a datacenter. This can be extremely valuable in terms of keeping the video recordings safe and protecting them from break-ins, fires or other tragedy that can occur. Finally, Ip cameras now are usually 2-5 times the clarity and resolution of analog cctv cameras. This means one ip camera can do the job of 2-3 analog cameras. Many ip cameras have resolutions of 1-3 megapixels. This allows advanced details of facial features, license plates, and other critical areas that police and law enforcement usually need.